Lawrenceville Family Dental Care provides a full range of restorative and cosmetic dentistry services here in Gwinnett County, including dental bridges. Our comprehensive dental practice is led by Dr. Ashish Patel, who is dedicated to restoring and enhancing every patient's smile. Lawrenceville Family Dental Care is proud to utilize the latest in advanced dentistry to perform ultramodern dental procedures. Dental bridges are fixed appliances that serve as replacements for missing teeth inside the mouth. It is important that gaps in the smile be filled with some type tooth replacement to support the gums and jawbone so that deterioration does not occur and cause serious consequences to neighboring teeth. Porcelain bridges are ideal for tooth replacement because they can be customized to match the other natural teeth that remain in your mouth. Dental bridges are made with dental crowns and a metal wire. The crowns are attached to the adjacent teeth to hold the bridge in place, and a replacement tooth is fitted to fill in the space where the tooth is missing. Dr. Patel is proud to offer excellent dental bridges and other restorative dental procedures. 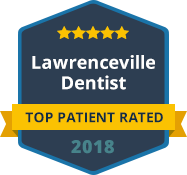 Contact Lawrenceville Family Dental Care today to start your journey to a complete, beautiful smile. Dental bridges are often considered to be cosmetic dental procedures because they are used to restore and/or enhance the appearance of a person's smile. Dental bridges are used to hide gaps caused by missing teeth, thus completing a smile that is incomplete. Cosmetic dental bridges are also used to help improve the stability of the mouth. When a gap is left between the teeth, the neighboring teeth are vulnerable to becoming loose and eventually falling out. A dental bridge helps to reduce the risk of future damage and issues within the mouth. Cosmetic bridges are often not covered by dental insurance. At Lawrenceville Family Dental Care, we believe that finances should never keep patients from receiving the dental care that they need. We offer in-house financing and CareCredit to qualifying patients in order to meet the needs of their budget. Contact Lawrenceville Family Dental Care today to schedule a consultation.